New Delhi, Aug 10 (IANS) After his critically-acclaimed "Omkara", director Vishal Bharadwaj is back with dark drama "Kaminey". Releasing Friday, this Shahid Kapoor Priyanka Chopra-starrer is all about gangsters, rebel soldiers, rogue politicians and crooked cops. The initial rushes and songs of the film have already created an unprecedented buzz among audiences and with a healthy round of eleventh hour promotions going on, "Kaminey" has gathered just enough momentum for its release. With advance bookings having already opened Sunday instead of a Wednesday, the movie is already heating up the ticket counters in terms of bookings and insiders claim it is going to be the next superhit of the year. The film revolves around twins - Charlie and Guddu - both played by Shahid. They are as different as chalk and cheese and can't stand the sight of each other till one fateful rainy night their lives cross. Charlie gets mixed up in a deathly get-rich-quick scheme, while Guddu realises that the love of his life, Sweety, has unwittingly put a price on his head. It's a dark comic ride thereon and their lives collide with the lives of gangsters, rogue politicians and crooked cops. In the middle of this crazy adventure, the brothers have to run to protect themselves, their dreams, their love.... And most importantly, realise that all they have is each other. Produced and distributed by UTV Motion Pictures, the film has been written and directed by Bharadwaj. Shahid plays a double role for the first time and it also has writer-director Amol Gupte making his on-screen debut. Industry sources reveal that the movie is made at a budget of around Rs.35 crore (Rs.350 million) and is releasing worldwide with around 1,100 prints and an 'A' certificate.
" 'Kaminey' is an important film for me as I have tried many new things in it. For the first time I am playing a double role and I'm trying something different from a love story. In fact, this is also the first commercial film of Vishal Bharadwaj," said Shahid. Distributors are also positive about the film.
" 'Kaminey' is going to be a super-duper hit. The songs are already a hit and like every UTV venture, the promotions are in full progress. Moreover, the unique plot and Shahid's double role has already created curiosity among the masses," said a Delhi-based distributor. "The biggest factor for the movie will be that it is releasing on the weekend of Aug 15, which will draw footfalls in hordes, as everyone will be having a holiday over the weekend," he added. "There is a big buzz for the movie and we have already started receiving a very good advance booking buzz... Independence Day holidays will favour the movie, bringing in a tremendous initial and a very good business," said Amit Awasthi, manager (programming and operations) of Spice Cinemas, Noida. "Kaminey" is Shahid's first outing in 2009 after last year's dud "Kismet Konnection" and Priyanka's first full-fledged role after a cameo in Shah Rukh Khan-starrer "Billu". The movie is also Bharadwaj's first venture three years after "Omkara". New Delhi, Aug 9 (IANS) Are they or aren't they a couple? That's a question Bollywood actor Shahid Kapoor steered clear of, even as he praised his "Kaminey" co-star Priyanka Chopra to the skies saying she is at her "career's best right now". "I always knew Priyanka is a very good actress and after working on 'Kaminey' with her, I realised that she has given one of the most splendid performances of her career. I think Priyanka is at her career's best right now," Shahid told reporters here Sunday evening. "Apart from that she is a team player and it's so great she did this film despite knowing that the hero has a double role. She is a self-assured actor and very confident. She knows whatever she does she'll give her best and she'll be noticed and appreciated by the audience," he added. Reminiscing on his camaraderie with the beauty queen-turned-actress while filming the movie, he said: "It was amazing and I had a lot of fun working with her. We started our careers almost at the same time (2003)." The 28-year-old actor was in the capital to be a part of BIG 92.7 FM's 'Dilli Ka Kaminaapan Quotient' contest and promote his film "Kaminey" at the radio station. The contest was won by 15 listeners who had to prove that they are the biggest 'kamina' of the city. Releasing Friday, "Kaminey" has been produced and distributed by UTV Motion Pictures and written-directed by Vishal Bhardwaj. Writer-turned-director Amol Gupte makes his onscreen debut in the film. Shahid is on a chain of promotion visits and has been noticed marketing the movie alone, without the leading lady. He explained: "Me and Priyanka are doing a lot of promotions together and also individually. We are together promoting (the film) and we recently did a press conference in Bangalore." "Kaminey" has had its share of controversies too considering a reported on-off relationship between Shahid and Priyanka. Shahid kept mum on this but insisted that such rumours added to "pressure" in a celebrity's life and career. "People say that any kind of promotion is good promotion but I don't personally subscribe to that... The rumours add pressure. It's difficult all the time dealing with all the speculations about your personal life but I guess as an actor it becomes a part of your job... its an occupational hazard. But it's not a great feeling... you have to learn to deal with it," he said. "It's ok to be a bit inquisitive about anything (from the media's side) but it's also important to have a little privacy of your own (for actors)," he added. Chandigarh, Aug 9 (IANS) Though "Kaminey" has been given an 'A' certificate it is not a film that will make viewers uncomfortable, promises Shahid Kapoor, who plays a double role in the Vishal Bharadwaj movie. The young actor also says that the film provides intelligent fare to the audience. "Normally filmmakers ask viewers to leave their brain at home when they come to see their movies, but here I am advising them to bring their minds along. It is not a run of the mill movie, it actually stands out," said Shahid. "Kaminey" is releasing Friday with 1,100 prints despite an 'A' certificate. "It is given 'A' certificate but it is a movie for all age group... it's not a film that would make you uncomfortable while watching. 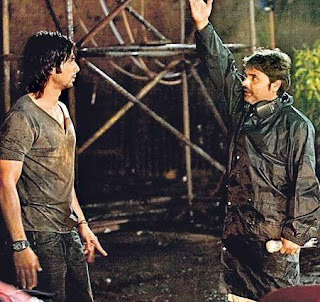 'Kaminey' will be my widest released movie so far. Till date my biggest hit 'Jab we met' was released in 927 prints but 'Kaminey' is releasing with 1,100 prints," said Shahid. The actor promises new things in the movie. "'Kaminey' is certainly an important film for me as I have tried many new things in it. For the first time I am playing a double role and I am trying something different from a love story. In fact, this is also the first commercial film of Vishal Bharadwaj," said Shahid who was here to promote the film. "I have seen the movie and also shown it to my family members. The movie has really come out well and we are getting good reactions," added the actor who has teamed up with Priyanka Chopra in it. Throwing light on his role, the actor said: "I am playing the role of Charlie and Guddu - two brothers - in the movie. They are entirely different characters and do not even match with my real life, therefore it was a challenging task for me to play the role to perfection." One of the characters he plays stammers and to prepare for the role Shahid met many ENT doctors, speech therapists and people with stammering problems. "As the protagonist in the movie has some speech disorder, I met many experts as we did not want to make a caricature out of the characters. We have portrayed them very seriously and sensibly," he said. About the title, he said: "When Vishal told me the title then I actually stood up in surprise. Even Priyanka and other star-cast were equally surprised. But when Vishal explained to us the plot, we realised that it is the most appropriate title as he wanted to communicate something that was really different." Shahid, who has six-pack abs in the film, says he is more concerned about building physical strength. "I'm purely vegetarian and crazy about my fitness. My main aim is to increase my physical strength and not the body size. I do an amalgamation of cardio-vascular exercises, free hand and weight training for four-five days in a week," he said. Bollywood actor Shahid Kapur (L) is welcomed by his fans before a news conference for his upcoming movie "Kaminey" (Rascals) in the northern Indian city of Chandigarh. Shahid Kapoor in 'Kaminey': Vishal Bhardwaj's next 'Kaminey' has Shahid Kapoor in a double role. Shahid plays the character of twin brothers who have different kinds of speech disorders. Among them, one lisps and the other stammers!